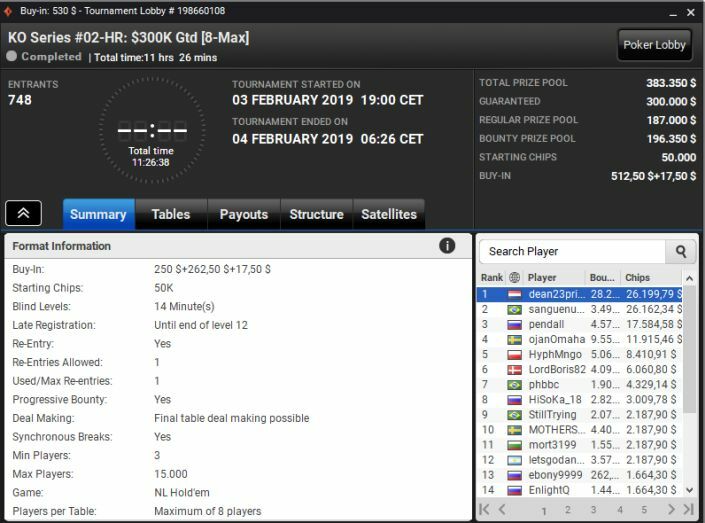 The $300k GTD High Roller started the ball rolling, pulling in 399 runners and seeing Canada’s fizzygypsy chopping the money with fumateotro from the UK, both players walking off with $29k plus change from the regular prizepool. The Canadian winner added a remarkable $35k in bounty money to his bankroll, $10k more than his runner-up challenger. The half-price version of the partypoker KO Series HR, with a $512 buy-in, drew almost twice as many entries, meaning there was just as much to play for as its big sister event. The top 5 would all make very appropriate five-figure scores. Dean23price came out triumphant chopping the top spot with Brazilian sanguenuzioi ,but stealing most of the bounties to more than double his payday to almost $55K total. 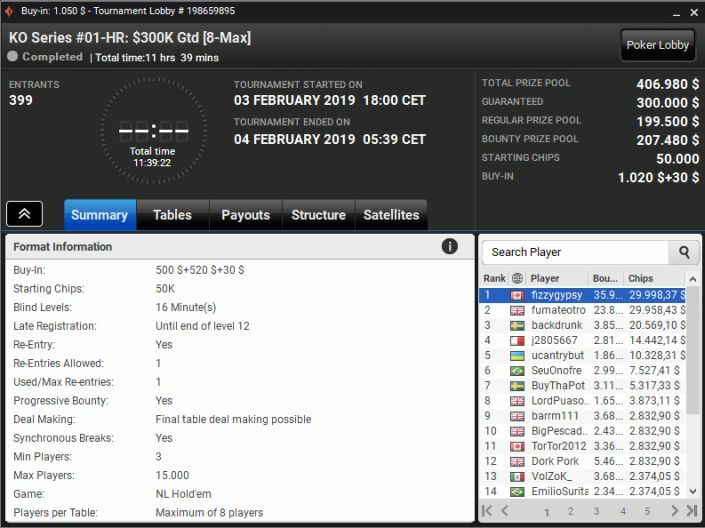 There was a UK flag-flying winner in the first of the 8-max $215 buy-in High events, with runningtheworld topping the $30k mark in a 1361-entry field, $18k plus $12k in bounties marking a successful 10 hour Sunday fight. Brazilian and German grinders were well-represented at the sharp end of the money battle, with Argentina’s sonmonedass sneaking in for an excellent 3rd spot at a tough final table. Down to the $109 buy-ins and the prizemoney wasn’t getting much smaller! More than 2500 entries meant that Brazil’s RMotoki found himself taking home $16k in regular prizemoney – and an extra $15k in bounties. The phrase ‘also-rans’ shouldn’t really apply to the mostly European finishers behind RMotoki, with the Russian duo in 3rd and 4th securing hefty cashes just behind German runner-up Gerhard1968. With the KO series only just started, and an added $350k for satellite players, the very healthy turnout is likely to continue through to the 17th February culmination. We’ll be back next week with another instalment of the partypoker Sunday grind roundup.